Fun bloggy news: I’m a KinderMom! I remember getting Kinder eggs from my grandparents when I was a kid, just about the same time they first became available in Canada in the early 1980s. (Did you know the brand is 40 years old?) I was fascinated by the exotic milky white insides of the chocolate eggs, aside from loving the wee surprise inside. Though I’m not a huge fan of chocolate, the kids know when they have a Kinder egg they always have to save a bite of that light/milk chocolate combo for me. They’ve always been one of my favourite treats to give and to get. That’s why I am happy to tell you that for the next year I’ll be working with Kinder Canada – I’m a Kinder Mom! The boys are, of course, absolutely delighted with the news. I’m pretty happy about it too. Although I’ve bought a lot (seriously, a LOT!) of Kinder Surprise treats through the years, I had no idea about some of the fun things they’ve been up to. For instance, just last month they set an official Guiness World Record in Toronto for the most people unwrapping chocolate at the same time. And starting this month, you’ll find a whole new set of Kinder Surprise toys: there are eight different Transformers toys and ten Disney Fairies toys available in specially marked Kinder Surprise eggs, for a limited time only. Let me know if you see them in Ottawa – we’ve been hunting high and low for them! So, TL;DR: smiles, chocolate, family activities, chocolate, silly photo fun, chocolate, happy boys (and Beloved!) and chocolate. 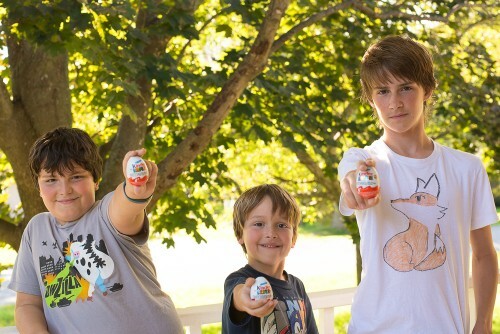 You can see why I didn’t hesitate to join the Kinder Canada family, right? 🙂 More Kinder fun, and maybe even some treats to share, coming up soon – stay tuned! yeah! love kinder eggs. but i do have a beef with them. when they went with the “pink” and “blue” eggs and completely genderized the toys i was completely turned off. the toys stores are so polarized by gender that i really appreciated the gender neutral toys of kinder eggs. i really hope the trend doesn’t last too long. i like not knowing what i am getting. Funny Julie, we were just talking about this on the weekend. I too dislike pink and blue genderized eggs, but the good news is that in searching for the new licensed toy eggs recently, I scanned a LOT of stores’ Kinder sections, and the vast majority of them seem to be plain old neutral white eggs. If I get the chance, I’ll definitely share your feedback with the Kinder peeps. Love those pics of your boys! I have two who both love their Kinder eggs as well! Just a question… does the fighting over everything ever stop? LOL!